ONE day all the foreign students under the scholarship at the university where I was in Germany were invited for a week’s seminar whose grand finale was a dinner party where students from different countries had to perform something that depicts the cultural side of their respective countries. Most students from other countries did their stints quite easily but when it came to Zimbabwe the 13 of us had not much in common, so we ended up singing the then national anthem “Ishe Komborera Africa”. And that got me. I left Germany with a clear mind that I have to be part of the team that would remind our folk of where we belong by studying the mbira and coming up with an improvement on the manufacturing, playing and amplification of the mbira instrument. This marked the beginning of the journey of the revolutionary of mbira music and traditional preservationist that was full of ups and downs for the mbira enigma Tendayi Gahamadze. Could this possibly be a spiritual calling? After Gahamadze left Germany in 1986, armed with a degree in metallurgy, he was determined to fulfil the promise he made to himself to develop the mbira musical instrument — also known as the “thumb piano”. No mountain was going to stand in his way. Gahamadze hung his degree on the wall and followed his dream, probably a spiritual calling and he never looked back. Today, 27 years later, he has no regrets whatsoever. Gahamadze was born on August 14, 1959 in a family of 10, five boys and five girls in Mashonaland West Province in Zimbabwe. He did his primary education at Mkwasha Primary School and went to Moleli High School. Gahamadze got a scholarship to study Pure Maths, Applied Maths and Physics and left for the United Kingdom in 1979. He completed his A-Levels in 1981 and got another scholarship to study metallurgy in Germany. He was introduced to music at a very tender age. His father was a drummer who performed at traditional ceremonies while his mother, a devout Christian, was the choir leader at the Methodist Church. “I used to sing at cultural gatherings and at primary school level. I was a member of the school choir. At Moleli, I was a member of the entertainment committee and I fiddled with the piano a bit. Whilst I was in the UK, I bought myself two guitars and hired a guitar teacher to teach me to play rock music by Jimi Hendrix, Led Zeppelin, Jethro Tull and others. And in Germany, I performed with bands playing and singing mostly reggae music,” said Gahamadze. Gahamadze has a solid musical background as he grew up listening to a variety of music on his parent’s gramophone. “We used to play vinyl records from all over the world. There was Simanjemanje music from South Africa, reggae from Jamaica, kanindo from Kenya/Tanzania, blues, jazz, rock and pop from America and Europe. “So I was inspired by many artistes at an early age. As I became older, I got most of my inspiration from reggae artistes like Bob Marley, Bunny Wailer, Peter Tosh, Burning Spear, Ras Midas, Mutabaruka, Banjamin Zephaniah and many others”. As if that was not enough, there were challenges from family members as well. “Some family members felt I could get a job at some firm and get highly paid as a manager or something. Fortunately, I had my wife who was working to make sure her husband fulfils his dream. Gahamadze was very determined to be part of the few who work for the preservation of the African tradition no matter what others say. He had a clear cut plan in his mind which he vowed to follow no matter the situation. Between 1987 and 1988, Gahamadze spent more than a year in Mhondoro at a traditional shrine where many traditional ceremonies were held and it was recommended to him by a spirit called Choshata that he should buy himself a mbira. 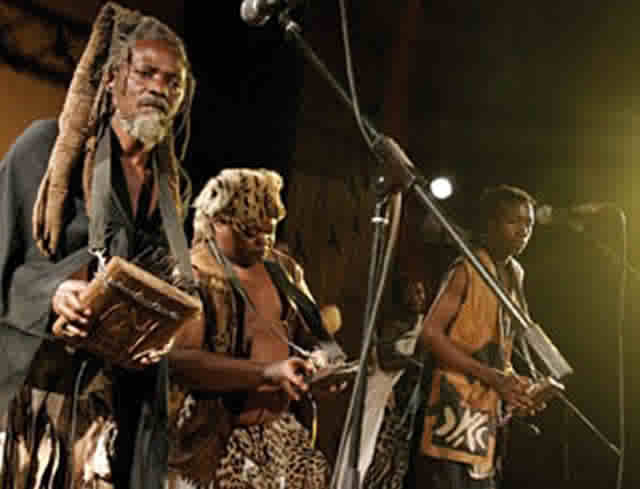 In 1987, Gahamadze formed the band Mbira dzeNharira. The group was pregnant for 11 years and finally in 1998 gave birth to their first born, the debut album “Rine Manyanga Hariputirwe”, which became an instant household phenomenon with the hit songs “Ndoenda Kwaambuya”, “Magamba”, “Muchati Kudiiko”, “Tatadzeiko” and “Kumakorodzi”. “One could hear the CD being played in almost every car and on all radio stations and since every album by the group has had at least one hit song. “We became famous overnight as it were, when this album came out and naturally with fame comes opportunities,” says Gahamadze. On asked where the name Mbira Dze- Nharira came from, Gahamadze responded, “In 1985, the spirit medium (of the spirit called Botemupote) occupied a farm owned by Mr Hinds. This farm was Kawanzura’s ancestral land. The farmer tried to evict him but failed. “This place is part of the Nharira Shrine (between Norton and Harare) where cultural ceremonies, including rain-making ceremonies, are held. So, the name Mbira dzeNharira comes out of admiration of the prowess of Botemupote” said Gahamadze. The album “Gomo Remandiriri” followed in 2000 with the hit songs “Nharira” and “Ini Chivanhu”. The year after they brewed “Tozvireva Tingaputika neShungu”, with the hit songs “Taivaziva”, the title track and Kumatendera (Nama Award Best Video). In 2003, they released the album “Toita Zve- rudo”, “Gonamombe Rerume” was released in 2005 with the hit songs “Mukono Watsauka” and “Dondipawo”. Also in the same year, Mbira DzeNharira was granted a culture centre by Norton Town Council as a token of appreciation for putting Norton on the cultural tourism map. The centre is funded by Mbira DzeNharira with occasional assistance from a local businessman, George Mutongwiza. In 2006 they released “Fare Fare Tindike”, with the hit songs “Musanditange”, “Marimuka” and “Shanyai”. In 2008 they released “Todya Pfora”, which was followed by “Nyamubvambire Wamuka”, in 2010, “Dziva Renjuzu” in 2011 and last but not least “Kudya Kwenzeve” which was marketed and distributed in the United States of America. The current members of Mbira DzeNharira are Tendayi Gahamadze who is a composer, arranger, mbira player and singer; Chaka Chakandika an arranger as well, mbira player and singer; Clemence Rice on bass mbira; Takawira Devera, a mbira player and singer; Tendai Kazuru and Wilson Assan on percussion; Norest Kawanzaruwa a dancer and last but not least Tonny Khumalo, a sound engineer.